Jul 27 A new dress, for Anwen. My sweet little Anwen came home for a short visit and has inspired me to test my sewing abilities once more and try a different shape of dress. Here is the result. With added volume to the sides, versus the whole skirt. A new dress for Anwen, by Fig and Me. This dress is very reminiscent of the one I sewed for Louella, though obviously not the same. This one was much easier to accomplish and involved way less shot brain cells, so I am extremely happy (though not entirely satisfied) with the result. The dress is made with the most supple and beautiful cotton double-gauze fabric. I purchased this from my dear friend Debbie at Little Oke Dolls (she has this fabric in many colours and you will start seeing it pop here and there in my Fall creations, be ready). Art doll clothing, with vintage lace. 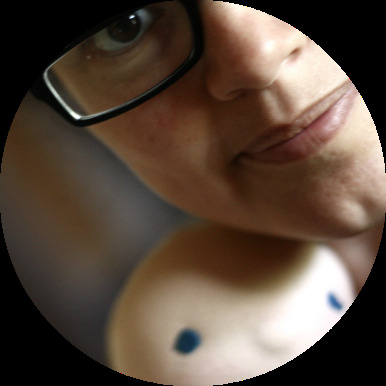 By Fig and Me. Anwen modeling her new doll dress, by Fig and Me. The buttons are vintage glass ones that I bought ages ago, every now and then I use them on special dolls and they have a sweet blush pink tone to them so obviously perfect for Anwen's dress. Truth be told, she was wearing a cashmere/lambswool/alpaca dress and just looking at her in those clothes made me hot. A new dress was in order. The lace is also vintage but it was given to me by my dear friend Agnes at Lalinda. She gifted me the most precious brown bag full of fancy design tulle, cotton torsion lace and vintage lace. I salivate at the thought of all the wee doll dresses I am going to embellish with her generosity. Anwen was the first recipient. Vintage glass buttons on Anwen's new doll dress, by Fig and me. 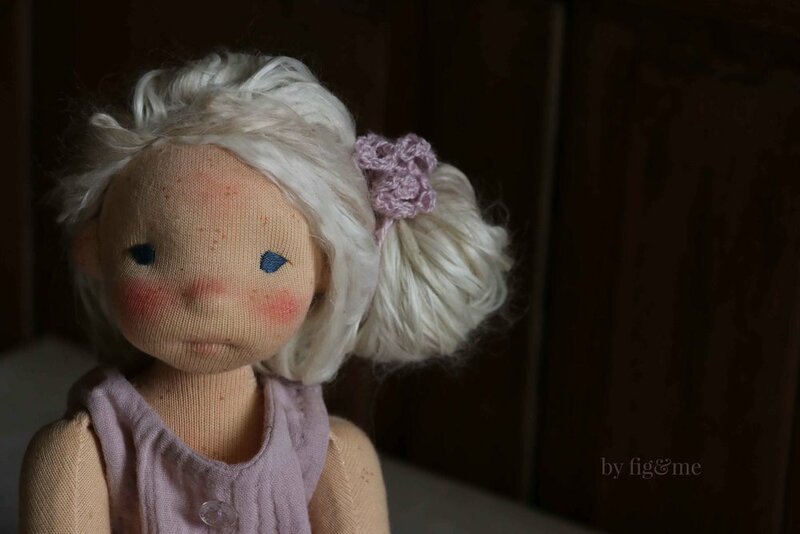 Anwen, a natural fiber art doll by Fig and Me. Of course, we needed a little accessory to tie Anwen's hair and I have gone ahead and made her a simple hair tie with a Chinese crochet flower. Why Chinese? I have no idea, that's how they are called in my book. This helps to keep Anwen's long Suri Alpaca locks out of mischief while she is out and about in the garden. I was going to line the dress but the heat and also the puffiness of double-gauze prevented me from doing so. I happen to prefer to hand-sew strips of self-bias tape to finish necklines and armholes when dealing with such demure fabrics. I believe it highlights the fabric much better than having a very obvious seam. I mostly line doll clothing, but sometimes this is just the technique needed to finish them. It is also very therapeutic to sit down and finish doll clothes by hand, it forces you to slow down. I know most of the time we can be in a hurry to finish something so we can either put it on the doll or send it away, but in this case it was just lovely to feel the double-gauze in my hands and to make wee stitches to close everything up. I almost hand-sewed the hem, but I chose "life" instead and did the whole seam with the sewing machine. I don't regret it because that hem needed a bit more stability to hold the lace firmly. And why was Anwen here, you ask? She needed her hair repaired, and as is something I do for free for all my dolls, I was more than happy to welcome her here. I have gone ahead (with a lot of cheek) and produced a dollmaking tutorial with step-by-step photos on how I sewed the wefts and attach them to her head, in order to achieve this ultra flawless look. You should be able to see it in the shop very soon. But for now, Anwen is going to pack her wintry clothes, buy herself a ticket and go home. She will not only travel in much more appropriate clothing, but she can also match Orla (her sister) in both spirit and looks. So do tell me what you think about her dress! Maybe I can keep experimenting with changing my go-to pattern and produce many different doll dress shapes. I am starting to feel very inspired to test my sewing knowledge. I hope you follow along with me. Jul 29 Dollmaking tutorial: how to weft doll hair, a new pattern. Jul 19 The Holland Experience. Mar 1 Bronwen, Anwen and Morwen: three natural dolls ready to play. Jan 22 From a white rose bush. Jan 23 From a red rose bush.